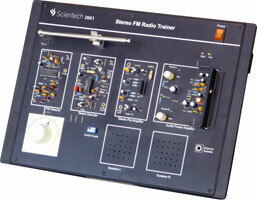 Scientech 2661 Stereo FM Radio Trainer is designed to cover the fundamental aspects of the subject. This is Student friendly and self contained, having all the basic required circuits and control on board. FM detection is described in the manual and covered in the experiments. Student trouble shooting work is included through switched faults in this trainer. This forms a complete training package of Stereo FM Radio trainer. Scientech 2661, Stereo FM Radio Trainer is an ideal platform to enhance education, training, skills & development amongs our young minds.